Carrabassett Valley Academy graduate and Monmouth native returns to sport after battling post-concussion symptoms. CARRABASSETT VALLEY — With the finish line just yards away, Amie Rowland stumbled. Taking a Did Not Finish was unacceptable to Rowland, not on her home mountain, and not in her comeback season. 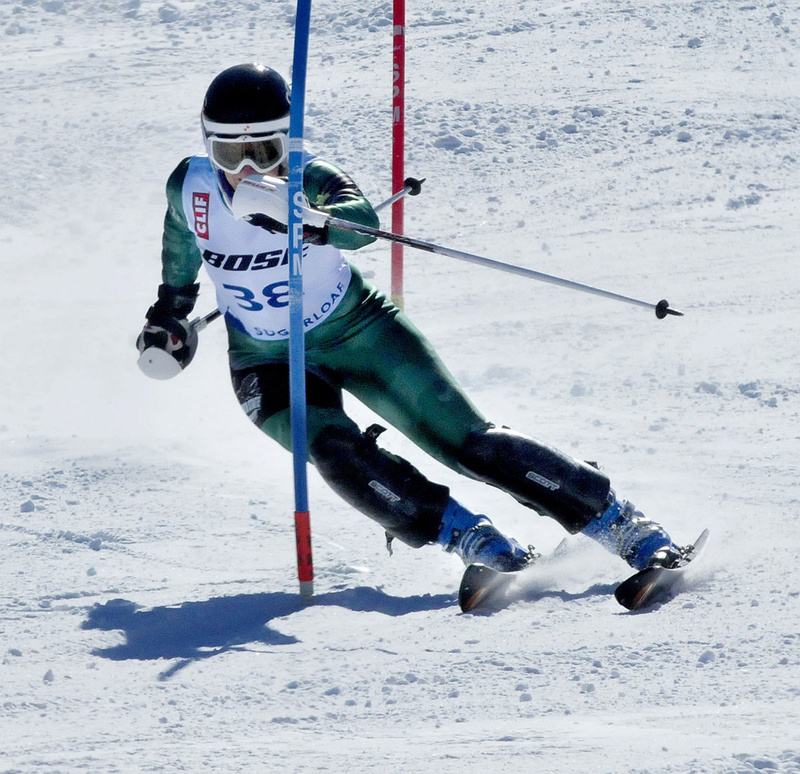 Rowland made the short hike back up to the gate, and completed her first slalom run at the U.S. Alpine Championships. The hiccup gave Rowland a time of 1 minute, 13.75 seconds, making her the last of the 53 skiers who completed the first run. Finishing run one meant Rowland had a shot at run two, and considering the five years she was away from the sport battling post-concussion symptoms, run two was a gift, no matter where Rowland was seeded. Her second slalom run of 55.38 seconds Sunday afternoon was proof Rowland’s comeback is on track. A concussion while training at Sunday River five years ago kept Rowland, a 2010 Carrabassett Valley Academy graduate and Monmouth native, from skiing competitively for five years. Now healthy, Rowland, 25, capped her comeback season with her appearance in the national championships on her home mountain. 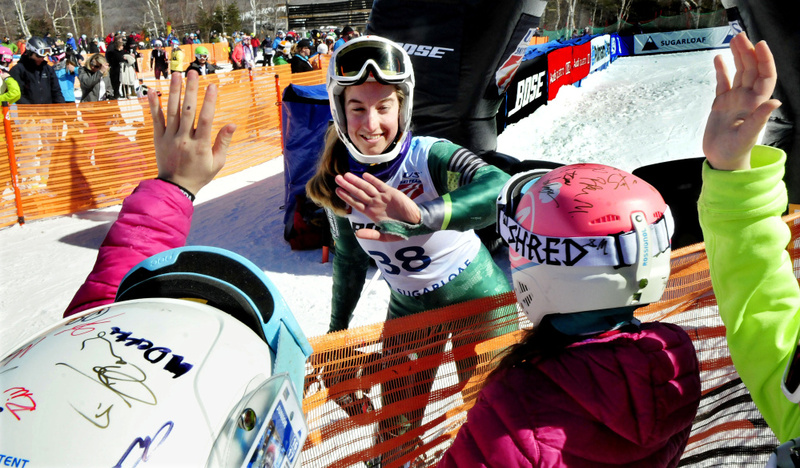 Rowland placed 16th in Saturday’s super G competition, and said it was a great way to kick off her nationals experience at home. Rowland’s mother, Cheryl, watched her daughter race and knew it was the culmination of five years of hard work. That 2011 concussion was her third concussion in three years, Rowland said. Forget how it disrupted her promising skiing career. This concussion disrupted Rowland’s entire life. “I just had headaches for years. Any time I tried to do anything that wasn’t sit on my couch in the dark, in the quiet, I would just get killer headaches. It just never really healed,” Rowland said. Rowland enrolled at Harvard, but the noise of the city and the Boston area was too much. Noise triggered headaches, and the situation was unbearable. “I used to struggle a lot with noise, and the city, Cambridge, Harvard is right in there. I couldn’t deal with it, and it was so stressful,” she said. To get her life back, Rowland worked with neuro rehabilitation experts. “They had me do PT (physical therapy), occupational therapy, speech therapy, all these things to teach me how to retrain my brain to understand everyday life,” Rowland said. Cheryl Rowland said Amie was an active child growing up. Seeing her daughter struggle to do anything was tough. Slowly, Rowland began to feel better. Two years ago, she went back to school, this time at Plymouth State University in New Hampshire. She eased her way back in college life. Just a few classes at first, with no extracurricular activities. Definitely not competitive skiing, not yet. During her recovery, though, Rowland had skied. Rowland saw being on the mountain as part of her therapy, another piece of the recovery puzzle. “I was skiing again that winter (of the concussion). They tried really hard to keep me off snow when I get concussed. Being around this kind of stuff, just going skiing really carefully, it helped my mood a lot,” Rowland said. Coming into this season, Rowland finally felt well enough to race again. She joined the Plymouth ski team, and began entering races. Her first race back was a slalom race at Sugarloaf last December. As she waited in the start, Rowland cried. “I didn’t think I’d be able to ski race again, so I was really, I guess, grateful,” Rowland said. Rowland competed in two races that day, placing third in one of them. “A pretty good comeback,” she said. Now that’s she’s raced in the national championships, Rowland’s comeback is complete.